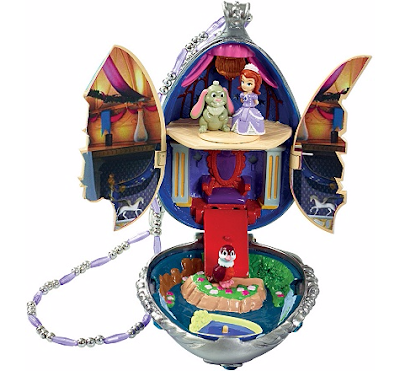 WIN #1: Sofia the First Magical Amulet Playset from Flair! Win a Sofia the First Magical Amulet Playset from Flair worth £19.99! Set in the storybook world of Enchancia, Sofia the First is an average girl whose life suddenly transforms when her mother marries the king and she becomes a princess. Sofia must learn to navigate the extraordinary life of royalty while holding on to her own hopes and dreams. Sofia’s Magic Amulet opens up to reveal three levels of Enchancia’s castle; a lake complete with a moving boat, throne and ballroom. This magical micro world has movable parts, music, lights, furniture that the dolls can use and a spinning dance floor that you can peg your dolls on to. The Amulet comes with 3 micro doll characters: Sofia, Clover and Mia. Contents: Magic Amulet, 3 micro doll characters (Sofia the First, Robin and Clover) and 3 LR44/AG13 batteries. Please note: You must at least follow/like both Unique Young Mum and Flair on at least one social media platform! To find out more about Flair and their other brilliant products, check out the official website here.